When you hire professional movers, you’re hoping your move will go quickly and easily. And there are things you can do that will help that happen! Know all about access to your home before the movers arrive. Can the truck drive into the yard? Or must they park on a busy street with limited parking or time limitations? Do you need to reserve an elevator? If you have special items that may require extra hands, let the movers know in advance. Refrigerators, washers and dryers, and (oof!) pianos are heavy. If you’re doing your own packing, be finished before moving day. Stray lamps, leftover tchotchkes, and object thrown into garbage bags make a mover’s job considerably more difficult. But your mover will love it if your belongings are all in boxes, taped and ready to go. If you need assistance packing, we can help with that too. Be kind—don’t pack heavy items in large boxes. Books belong in small boxes; blankets, pillows, and lamps are fine in large ones. If a box is impossibly heavy, your movers may need to unpack it and start over. Full drawers add weight and can cause trouble when items shift and drawers slide. With heavy items such as filing cabinets, full drawers can make them too heavy to move. And little items in end tables can go missing when left in drawers. Pack these items up. It’s helpful for you to know what’s in each box. But for your movers, it’s even better if they know where it goes. That way you don’t have to point to a room for every incoming box. Make sure the movers know the difference: Which room is Tiffany’s and which is Tim’s? Which is the living room and which is the den? You can label the rooms in your new house, too. It’s helpful to put all your regular boxes in one place, and all your valuable items in another. Anything of special sentimental or monetary value can be flagged so your movers know to use extra care in packing and moving it. This goes for tiny jewelry items and large antique armoires—anything valuable or delicate should be set aside. Handle small important items yourself. Cash, jewelry, and medicines can be hand-carried. Don’t help. Stand back! You hired movers for a reason, and they are used to working together. Let them do their job and it will go much more smoothly. We are the pros, after all, and we’re happy to do our job. Don’t disappear. Your movers will have questions about where things go, what not to move, and more. Be nearby to provide direction, and if you need to be in another room, let them know where to find you. 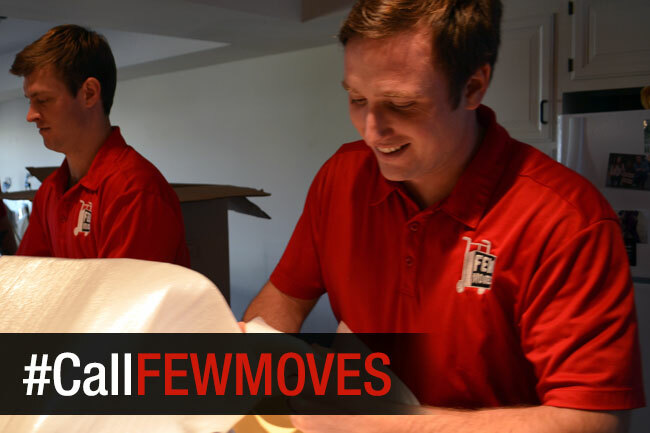 Few Moves Moving Company looks forward to your moving day! Call us today at (910) 512-6999 in Raleigh or (910) 512-6999 in Wilmington, NC for the best service and the best movers in town.